This workshop is perfect for anyone who’s ever paused an animation or video game just to admire the beautiful artwork. 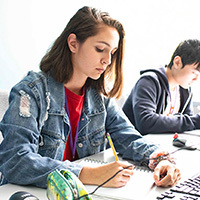 Students study the skills, tools, and processes that production artists use to create art and animation for today’s video games and animations. The field of electronics is ultimately all about how we can manipulate electrons to allow devices like our cell phones, microwave ovens, and even automated heart defibrillators to work. In this workshop, students conduct experiments and build a variety of projects to demystify the exciting world of the electron! From smartphones, to space stations, it is the job of the engineers to design the many amazing products we use every day. In this workshop, your kids will have the chance to build, test, and even break a few things – all in the name science of course. We will look at different engineering disciplines and discover how they design, build, and test things. In Exploring Game Creation, kids will look at video and tabletop games and use what they learn to create a series of games. With the guidance of our teachers, kids will design and construct card games, dice games, and board games. They will then work in teams, to playtest and use constructive criticism to make their games into something they will be proud to show off to friends and family. Games are fun to play, but they’re even more fun to make! In Exploring Game Design, we have created a fun and supportive environment for your child to discover what it takes to create tabletop games and video games. They will discover how game designers use math, science, art, and sound to create engaging player experiences. At the end of the week, your child will take home a board game and a video game of their own creation! You don’t need to be able to write code to understand how computers make decisions. In this workshop, your child will use fun activities and games to design and build their own decision engines. The basics of machine thinking will be explored by looking at and building simple combinations of logical elements. This workshop dives deeper into the complexity of how computers work and the myriad of tasks we give them. 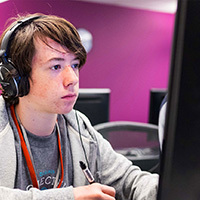 Using a variety of unplugged and computer-based activities, students will uncover a new level of game programming detail. 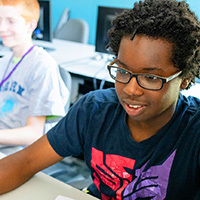 Students will be introduced to how a computer stores data for rapid access, how a computer keeps data organized, and how to integrate more complex algorithms into their games. Robots have been a subject of fascination and entertainment for generations, both in fiction and in real life. In Exploring Robotics, your child will learn about how robots move, see, touch, and hear. Under the guidance of classroom instructors, students will apply what they have learned by designing, building, and programming their own robots and mechanical devices. Building on the basic concepts presented in Exploring Robotics 1, this course engages students to solve challenges that include engineering, robotic, and science elements. By combining their research and problem-solving skills with their limitless imaginations, students will design robots to complete specific tasks.